Michelin is pleased to unveil the selection of the MICHELIN Guide France 2019. With 632 starred establishments, this year’s guide has grown with 75 new establishments gaining either one, two or three stars—a record level never seen before. Nestled at the foot of the mountains that protect the city of Menton, Mirazur, brilliantly led by chef Mauro Colagreco, gets three stars in the 2019 selection of the MICHELIN Guide France. In front of the Mediterranean Sea, the chef allows his customers to live a unique and enchanting gastronomic moment. Here, the dishes offered invariably follow the cycle of the seasons and magnify with delicacy and subtlety the products of the sea and the mountains, as well as the fruit and vegetables cultivated in the kitchen garden of the chef. At Mirazur, the menu is always full of amazing surprises that play with textures and combine bold flavors with simple and colorful presentation. Photo courtesy of Les Clos des Sens. Le Clos des Sens also receives the highest distinction in this year’s MICHELIN Guide. In this unique establishment located in Annecy-le-Vieux, chef Laurent Petit and his team propose lake-sourced and vegetable cuisine that highlights the best products of the Annecy terroir. After a ‘cookout’ that led him to rethink his cuisine in depth, chef Petit creates exceptional dishes and that express the very essence of the herbs and vegetables he grows as well as the fish caught in the three lakes of the Savoie: Lake Geneva, Lake Bourget and Lake Annecy. Five new two-star establishments enrich the 2019 selection. In Cancale, at Hugo Roellinger’s Le Coquillage, the dishes reproduce the trips so dear to the chef's heart. At AM by Alexandre Mazzia located in Marseille and led by the chef of the same name, we find dishes that subtly marry spices recalled from the chef’s childhood, which were spent in Congo-Brazzaville. Here, we savor unexpected combinations imagined by this balancing of flavors. Christophe Hay at La Maison d'à Côté creates dishes which are a real ode to the land of Loir-et-Cher. In addition to sublimating local products in an innovative cuisine, the chef maintains a 16,000-square-foot garden that feeds the restaurant. In Paris in the center of the 7th arrondissement, David Toutain, at the helm of the restaurant that bears his name, is developing signature cuisine using mainly vegetables and which testifies to his research into textures and stands out for its deep flavors. Finally, La Scène, a restaurant at the Prince de Galles hotel, whose kitchens are led by chef Stéphanie Le Quellec LE also earns two stars. Here, the dishes are designed with finesse and accuracy, and are bursting with impressive flavors. This distinction crowns the very successful career of this brilliant chef. In total, the 2019 France selection sees 68 new one-star addresses. Many of them are led by young chefs brimming with passion and talent, some of whom show real entrepreneurial courage. One example is Guillaume Sanchez’s restaurant, NESO, located in the 9th arrondisement of Paris, where the 28-year-old chef has a strong sense of culinary identity, developing his work around the fermentation of vegetables and cold extractions. At the Table de l'Ours in Val d'Isère, Antoine Gras makes remarkable dishes and lives up to his talent. In Roubion, our inspectors awarded a star to Auberge Quintessence, a lovely project by husband-and-wife team Guillaume and Pauline Billau. Le Château de Vault-de-Lugny near Avallon is run by a young couple: Franco Bowanee takes care of the savory offerings while Karina Laval runs the pastry department. In Carnac, Laetitia and Stéphane Cosnier form a remarkable duo at the Côté Cuisine restaurant. Nolwenn Corre heads the kitchen at the Hostellerie de la Pointe Saint-Mathieu, while Naoëlle D’Hainaut offers dishes of very high standard at L'Or Q'idée in Cergy-Pontoise. In Paris, Julia Sedefdjian is the youngest chef in this year’s selection. After Les Fables de la Fontaine, Sedefdjian’s new restaurant Baeita receives a star. Also in Paris, Virtus and Accents Table Bourse offer collaborative cuisine created respectively by the duos of Chiho Kansaki and Marcelo Di Giacomo, and Ayuni Sugiyama and Romain Mahi. In the heart of old Lille, head pastry chef Camille Pailleau and chef Diego Delbecq offer dishes that cross modernity and tradition at Rozo, while Virginie Giboire at Racines in Rennes cooks tasty and well-mastered combinations. In a former 17th century presbytery located in Vailhan, Amélie Darvas, who runs the kitchen of Äponem-Auberge du Presbytère, accompanied by her accomplice, sommelier Gaby Benicio, plays with authentic and daring flavors and magnifies local products from both the market and their garden. Finally, this selection is enriched by a variety of cooking styles that are expressed throughout the country. 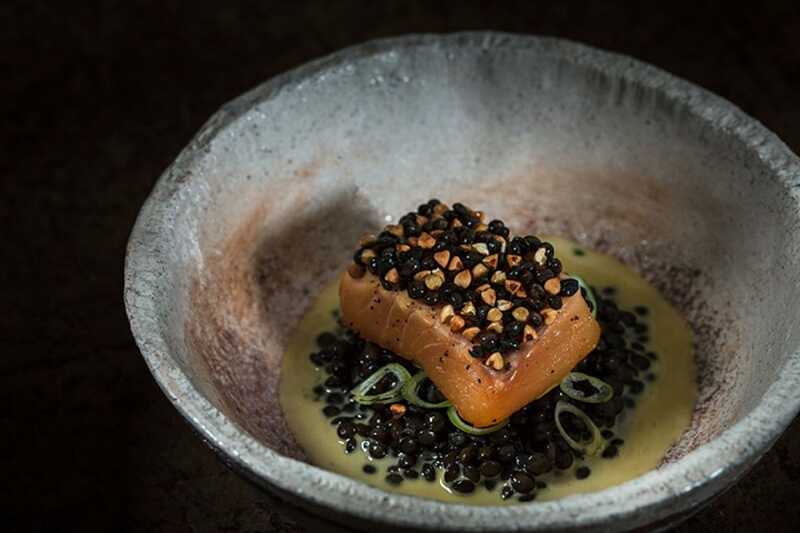 In Altkirch, for example, the restaurant L'Orchidée run by chef Chatchai Klanklong marries the scents of cuisine from his native Thailand as well as other influences from elsewhere. Our inspectors were surprised and seduced by aged beef cooked with a blowtorch, avocado, nuoc cham and coriander, in all ways remarkable. At La Condensa in Paris, which is named after a district of Mexico, chef Indra Carillo Perea uses a technique learned from the biggest names in French gastronomy and is inspired by several gastronomic cultures to develop a cosmopolitan and creative cuisine. Finally, in Courchevel, Sarkara, located in the K2 Palace, is the first starred restaurant to offer only desserts. In this estabishment, diners will savor atypical pastry work where chef Sébastien Vauxion imagines a tasting menu giving pride of place to innovative fruit and vegetables. Congratulations to all restaurants. View the full selection here.